The Blodgett Hydrovection saves you time and money on both cleaning and maintenance. The 316 stainless steel liner with coved corners, large 2″ diameter center cavity drain and retractable hand shower make it easy to clean your Hydrovection, even after a day of continuous cooking. Easy to remove baffle for blower wheel cleaning. Slide out front service panel, so there’s no need to move the oven, your technician can service it in place. Over 90% of the components on the Hydrovection can by serviced from the front including enough wire to pull the motor through to the oven cavity. INCREASE YOUR YIELD – Cooking with humidity in the Hydrovection increases your product yeild up to 15% over a standard convection oven. Greater yield means higher profits for you! FASTER COOK TIMES – The moisture in the Hydrovection results in a 15% decrease in cook times, allowing you to get your product to the table faster. SAVE SPACE IN THE KITCHEN – The Hydrovection is the only split door, continuously humidified oven on the market. 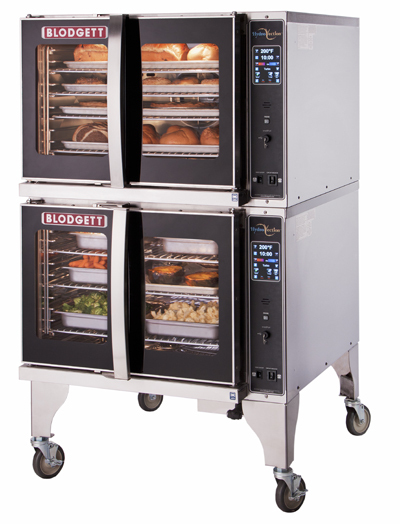 With it’s compact 38″ footprint, the same as your convection oven, the Hydrovection saves space in your kitchen. The Hydrovection allows you to do more, bake, roast, gratinate, poach … in less space. SAVE LABOR – If you can cook it faster, if you can cook in one step, if you serve the customer faster, then isn’t it a winner?